Hi there. I have about 2000 entries in my Enpass Vault. In the first days after installing the beta, everything works fine, but now Enpass does not find entries. E.g. I have a login entry with a username starting with appdev... When I search for it, Enpass does not find it. When I search for the title, it will be found. It's a kind of mystery... maybe a index or caching problem ? I would like to share that there are two ways to control search functionality. Title: Selecting this option will search only the Title of the items. Fields: Selecting this option will search the field values and Title of the items. Passwords: Selecting this option will search only the Password fields of items. 2. By enabling the option Search in All items in Enpass General setting. 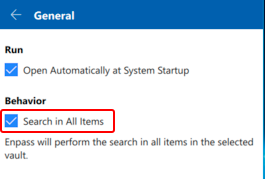 Could you please try searching for the item by enabling these options accordingly. However, as you mentioned, "installing the beta, everything works fine, ﻿but now Enpass does not find entries." I've forwarded this issue to the testing team to look into it. Jup. I have these options enabled. On ios, with both options enabled, the search is much faster. Since 220 it's better, but still slow. I face this problem too. I use both Enpass6 and Enpass 5. I tried searching title, field and password. 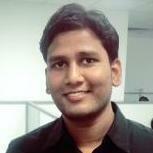 I created 2 logins recently with Enpass 5. It works as expected no issues. But when I switch to Enpass 6 (Mac app) I couldn't find them. For one of the logins, I tried to login to the site and the Enpass 6 Chrome extension picked it up. After that, the Mac App picked it up too. For the other, Enpass 6 extension suggested I add the credentials as a new entry, which I did. When I compare the enpass 5 vs 6 version, I noticed that there is something new called "Show webform" in enpass6 which maps fields in the site to fields in enpass. This is not shown in enpass 5. Not sure if that makes a difference. For this second credential, I also noticed that I cannot find it in Enpass 5. It may be that the way you guys are storing the entries and parsing them from the walletx file from these applications breaks compatibility. Not sure, though. Hello, are the options working properly for anyone? I have the "search in all items" checked but the search results still do not include the values of each field.